Steel cut oats, also known as Irish oats, have become our new breakfast of choice (that is, once Chicken Biscuits (for me) and Bacon, Egg, and Cheese Biscuits (for Patrick) were taken out of contention). If you haven’t tried steel cut oats, they have a rich, nutty texture and are very healthy – high in fiber and protein. Don’t they just look healthy? 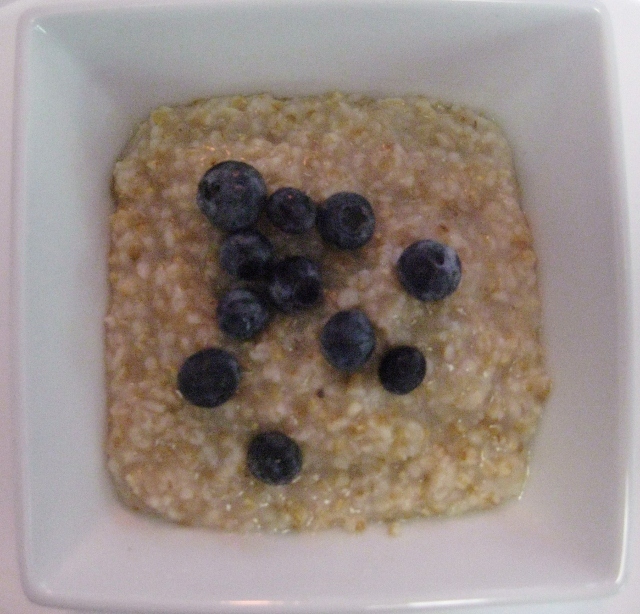 The steel cut oats take a bit longer to cook than rolled oats (around 30 minutes) but, like most grains, reheat well. So, you can cook enough for few days and warm them in the microwave as desired. While there are quite a few recipes on the internet, my suggestion would be to serve them as you would normally serve any oatmeal. (I suspect that there are a few readers who are thinking, “I wouldn’t serve them at all” and a few others who are thinking “I certainly wouldn’t reheat cold oatmeal”). The key to remember in cooking steel cut oats is to use a ratio of 4:1 (liquid to oats). For a big batch of oatmeal, I bring 8 cups of water to boil and add 2 cups of oats (tempting to make that into a math problem…). Reduce the heat, and let simmer until the water is absorbed and the oats are at a pleasant texture…A pretty simple recipe – one that is in my skill set. 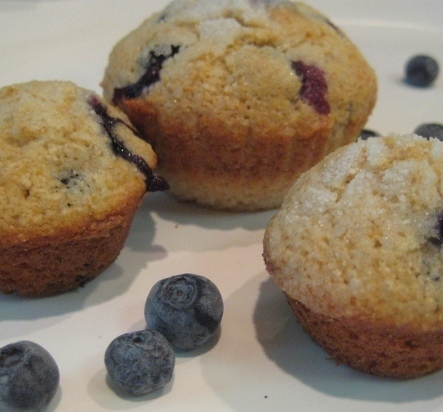 It is July 1 at last and my first cooking project of the locavore year is a breakfast treat – Blueberry Muffins. In our “Getting Ready” phase, I discovered that my family is most happy when they know there is food to eat (go figure!) In Maslow’s Hierarchy of Needs, food is one of the physiological needs at the base of the pyramid, so this shouldn’t be too surprising…but there seems to be an inordinate amount of panic in my house if there appears* to be no food around that takes less than 30 seconds to prepare. This anguish is most noticeable in terms of snacking and breakfast. So, while it would be interesting to focus on splashy, delicious local-food based lunches and dinners, my top priority is actually building a stock of quick, easy, and appealing* breakfast and snack items. One of the most versatile food items for me is the mini-muffin: paired with a glass of milk, it makes a decent breakfast or snack, it freezes well and can be warmed in the microwave in less than 30 seconds, it is easy to bake from a variety of local foods and common pantry items , and most importantly, everyone likes them! Below is the recipe for this morning’s muffins. I made 24 mini-muffins and 2 regular sized ones. I have added notations on the recipe categorizing the ingredients (legend at right). This recipe is adapted from Pillsbury’s Complete Book of Baking. Preheat oven to 400F. Grease mini-muffin pan (I used Baker’s Joy cooking spray (P)). Combine flours, sugar (less the 1 T), baking powder, and salt. In a separate bowl, combine milk, oil, and egg. Add to dry ingredients and stir until moist. Add the blueberries. Fill the muffin cups and sprinkle the reserved sugar on top**. Bake until done, approximately 10 minutes. *Appearance and marketing is a crucial component to this project. **Visible sugar suggests sweetness (without increasing the overall sugar content).